Pakistan Mag Blogger Template is richly based on the cultures, traditions and beautiful gestures of the peoples living in the four provinces of Pakistan. Pakistani Mag Blogger Template is richly based on the cultures, traditions and beautiful gestures of the peoples living in the four provinces of Pakistan. Since, this theme is coded by few bunch of Pakistani’s so you can always believe that they have put all the skills they have and have formulated a total masterpiece. It has some impressive features with totally amazing outlook. From color combination to the selection and styling of widgets everything is so clean and attractive. We have used Green, white and blue colors which give it an inspiring touch. There are many features, out of which can be seen below. 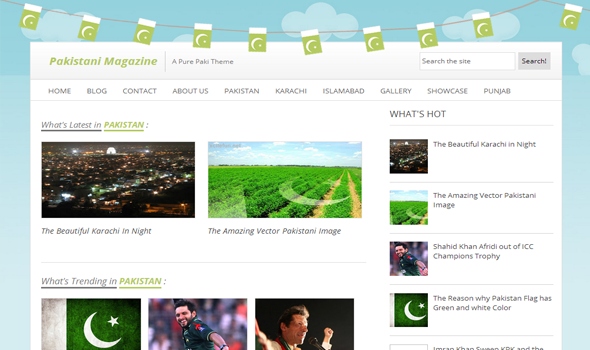 This theme is ideal for those blogs who are covering “PAKISTAN” or their blog some way inter links to it. A Pakistani Theme: Just like we have said before, this theme is a reflection of the people living in Pakistan. It is decorated with the Pakistani Flags and decorating items. This is the reason why, it gives you a slight out look of the subject of the theme. Featured Post Areas: We have connected two featured post gadget areas in this theme. It would fetch your posts from a specific label and will display them on your homepage. However, the latest posts would continue to display beneath them. Robust Commenting System: Finally, in this theme we incorporated a wholesome Robust and elegant commenting system. It has some hand full of features. The most prominent feature is the “Verified” Icon that appears only with the BLOG Admins. It differentiates the comments of an admin and the users. Pretty cool it looks like. Elegant and Beautiful Footer: The footer is extremely elegant and has the capacity to accommodate 3 widgets in a row while unlimited in columns. While the complete outlook is pretty decent, it looks perfect on the theme. Related Posts: This theme also has a related post gadget which appears just beneath your posts. It displays related posts in systematic order along with their featured thumbnails. SEO-Friendly: This theme is absolutely brilliant for search engines. This theme has the highest search engine optimization score. The speed of this template is 90 out of 100 according to Google Speed insights. More Features: Magazine Style, greenish color scheme, threaded commenting system, 2 column template, sidebar and much more. This theme has two featured areas, one allows you to show up-to two featured posts while the shows three. These areas would not fetch your posts until you use a certain "Label" on your posts. So we will be explaining you how can show posts on these feature areas. Now either replace "Latest" from the following coding to a keyword that you want to use as a Label so show up posts in this featured area. On second thoughts, you can tag your posts with "Latest" label and those posts would start appearing in What's Latest" Area. Now either replace "Trending" from the following coding to a keyword that you want to use as a Label so that it show up posts in this 2nd featured area. On second thoughts, you can tag your posts with "Latest" label and those posts would start appearing in What's Latest" Area. We hope everyone enjoys this one of its kind theme for blogger. Though, this is not it. After creating a theme for Pakistan, we have gotten a lot of requests from our followers to create one for their country too. In coming days, we will cover India, Indonesia, Tunis and other countries. Please, let us know about your country so we can include that too. Let us know what you think in the comments.